Next book in my travel to Star Trek literature and again a TNG book. 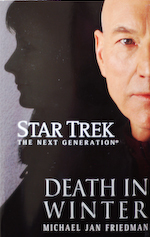 Death in Winter is set right after the end of Nemesis or even I guess after Trust yourself when all men doubt you, the last story in the TNG anniversary anthology The Sky’s the Limit with Captain Picard trying to deal with his close friend and secret love (secret for whom isn’t really the question here, I guess) transferring over to SF Medical. But right after getting there she accepts a secret mission into Romulan territory and goes missing. So guess who SF asks to go after her *rolleyes*. Bingo: Picard and 2 of former colleagues from the Stargazer, his former head of security Peter Joseph and his former CMO Carter Greyhorse who is the only person who might be able to solve a medical problem on that Romulan-occupied world and is therefor released from prison. As a side-story you also learn about some fights between the new Praetor Tal’Aura, Commander Donatra and a Romulan nobleman Eborion_ which is to some degree relevant for the other story, but I somehow … well, it for some reason simply felt wrong. Don’t get me wrong, it was interesting to learn something about the social Top1000 on Romulus, but at least the conflict with Donatra was simply in no way relevant for the rest of the story (for the timeline it definitely was important, but not for this particular book). Another bummer for me was the way in which some of the guest appearances were handled. For example Janeway has a short appearance and also Tomalak joins the party, but none of them (and Janeway in particular) seem absolutely replaceable and at least I got the feeling that they only were used to avoid some extra character development. Not even Sela (*rolleyes* again) felt irreplaceable here. They all get mentioned, do a thing or two, but nothing only they could have done in this particular way.